“Caddyshack”, directed by Harold Ramis and starring Chevy Chase, Rodney Dangerfield, and Bill Murray, is one of the most-popular golf movies ever made by Hollywood. “Caddyshack” is a slapstick comedy with several lines of dialogue becoming a part of everyday vernacular. Tiger Woods, who is currently making a run at the 2019 Masters, has been known to drop a few “Caddyschack” quotes. Produced by Orion Pictures and distrusted by Warner Brothers, “Caddyshack” made nearly $40 million at the box office for an R-rated comedy with a $6 million budget. The film featured the directorial debut of Harold Ramis. It is also the first major role for Rodney Dangerfield. The journeyman stand-up comic was a dilettante on the set, but got huge laughs in almost every scene he’s in. Doug Kenney started National Lampoon Magazine after he graduated from Harvard, where he wrote for the Harvard Lampoon. Kenney burned out of the magazine business and pivoted to Hollywood. He produced “Animal House”, which broke box office records as an R-rated comedy. Kenney grew up in suburban Cleveland, where his father worked as a tennis pro at a country club. Brian Doyle-Murray and Kenney co-wrote the first draft of “Caddyshack” together. As kids, Bill Murray and his brother Brian were caddies at Indian Hill Club in Winnetka, Illinois. Many of their childhood memories and co-workers inspired scenes and characters from the movie. Danny Noonan (Michael O’Keefe) is saving money for college by working as a caddy at Bushwood Country Club. He is often paired with eccentric millionaire Ty Webb (Chevy Chase), one of the best golfers at the club. Webb never keeps score and he dispatches advice to Noon using Zen Buddhism quotes. Lou (Brian Doyle-Murray), a degenerate gambler, runs the Caddy Shack and doles out assignments. Noonan finds out he can pay for college if he wins the caddy scholarship, which requires him to win the annual caddy tournament. Noonan defeats fellow caddy D’Annunzio (Scott Colomby). Meanwhile, Judge Smails (Ted Knight) sees a gopher on the course and instructs the groundscrew to get rid of the pest. Assistant groundskeeper Carl Spackler (Bill Murray) is assigned the task. Carl is a Vietnam vet with PTSD who also grows sod, which is crossbred with a potent marijuana strain. He also once caddied for the Dalai Lama. Judge Smails forces his spoiled grandson, Spaulding Smails, to play golf with him. The Judge is also trying to make sure his niece, Lacey Underall (Cindy Morgan), visiting from New York City, avoids getting into trouble with the staff. She takes a liking to both Noon and Ty Webb. When the Judge fins Lacey and Noonan in bed together, he flips out. To keep Lacey’s reputation in tact, the Judge later tries to blackmail Noonan. He will win the caddy scholarship is he keeps quiet about Lacey’s sexual appetite. Noonan’s other love interest Maggie, a young Irish woman working at Bushwood. Al Czervik (Rodney Dangerfield), a super wealthy construction scion, plays golf at Bushwood as a guest of one of the other members. The brash Czervik is new money compared to the crusty old money members that inhabit the club. Czervik rubs Judge Smails the wrong way by insulting his ugly hat. 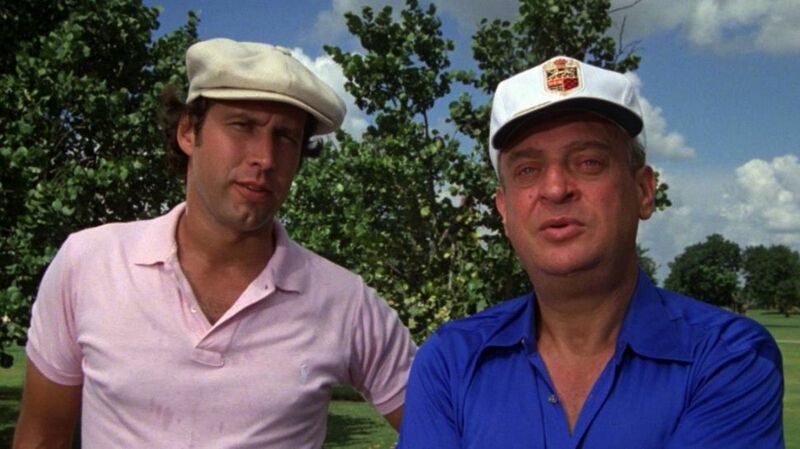 He later crashes his mega-yacht into Judge Smails new boat, The Flying Wasp. The two agree to settle their differences with a two-on-two golf match with Czervik and Ty Webb against Judge Smails and Dr. Beeper (Dan Resin), who won the club championship three years in a row. The stakes are raised throughout the match. It’s apparent that after nine holes, Czervik is a horrible golfer and that he will lose. Czervik fakes an injury and Noonan fills in as his replacement on the back nine. Noonan and Webb storm back to win the match on the final hole. Noonan actually misses the put that dangles along the side of the cup. Simultaneously, Carl the groundskeeper uses explosives to kill the gopher he had been stalking the entire film. Multiple explosions cause the ground to shake and the ball tips into the cup to secure a win for Noonan, Webb, and Czervik. “Caddyshack” is one of those quotable movies that everyone knows like “Fletch” or “The Big Lebowski”. It’s almost too weird if you don’t know at least one line from the film. After all, it’s the most popular golf movie ever made. Even golf haters adore “Caddyshack”. You really do not need to know anything about golf to enjoy the comedy. The original script by Doyle-Murray and Kenney involved a love triangle between two of the caddies and Maggie. There were also serious themes about the endless class struggle between the wealthy and the working class. Those storylines were cut in the editing room. Ramis and some of the actors were members of Chicago’s Second City improve group. They were used to coming up with jokes and lines on the fly. Their ad-libbing methods irked traditional actors such as Ted Knight. However, some of the lines ended up becoming classic moments in the film. “You buy a hat like this, I bet you get a free bowl of soup!” is one of those iconic lines that Rodney Dangerfield came up with on the spot. Kenny Loggins wrote several original song for the “Caddyshack” soundtrack, including “I’m All Right (Theme from Caddyshack)”. The soundtrack also included “Any Way You Want It” by Journey. If you enjoy sports movies, then do not miss our coverage of baseball movies such as “Eight Men Out” and “Field of Dreams” with Kevin Costner. Also, check out our feature on Steven Soderberg’s basketball movie “High Flying Bird”, which is currently available on Netflix.